This entry was posted in currency and tagged $100 bills, Benjamins, CNBC, counterfieters, government, high-tech, ultra-secure on December 6, 2010 by Roger Harris. Everything you could possibly want to know about the redesigned $100 banknote is now available online, the government announced in an e-mail blast to the media today. We’re talking videos, podcasts, photos and even an interactive quiz. The website seems a bit cheesy, but any business that handles cash should download the training materials to learn more about how to spot fake currency. 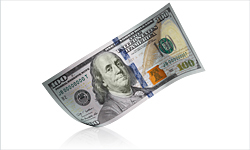 This entry was posted in currency and tagged $100s, banknote, Ben Franklin, cash, counterfeit, redesigned, Stephen Colbert on September 22, 2010 by Roger Harris.